Looking for the best squirrel repellent for your home or yard? Great! You're in the right place. 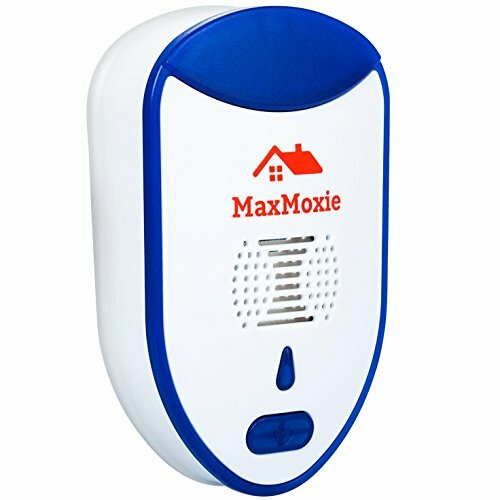 ​​Out of the repellers we reviewed, our #1 pick goes to the Max Moxie Pest Repeller. We found it has the most amount of authentic positive feedback after use. If you look around the internet, you'll find that there are A LOT of brands trying to sell these products. Most of them fill up their listings with fake reviews and outrageous claims. If you check out MaxMoxie's listing you actually get real people giving real feedback. In the case of this repeller, most of the feedback was positive and that it has proven successful shortly after being plugged in. Overall, we are a tad skeptical of pest repellers, but this model appears to be delivering the best results in its category. If you're considering a non-chemical approach to pest removal, we recommend giving the MaxMoxie device a go. It's rated to work up to 1200 sq feet and it can be placed in your attic, kitchen, garage, etc. Want to learn more about ultrasonic pest repellers and other things to be aware of when buying? There aren't any chemicals, harsh or otherwise, to spray and respray. You simply put these out, switch them on, and watch the fun. Give it a few weeks to see the results. ​What Kinds of Repellents Exist for Squirrels? How Should You Choose a Repellent? If you're short on time, or just want it now, here is a quick summary to wet your whistle. Or you can keep on reading to get the full story. Check out our summary list below, or keep reading for a more in-depth review of squirrel repellents. Want to skip all this research and just hire a decent exterminator for your squirrel problem? Read more: Click here to learn more about squirrels. ​What are ultrasonic repellents and do they work? Ultrasonic is any sound wa​​​​ve above 20,000 hertz (20 kilohertz aka 20 kHz), which is above the ability of the human ear to detect it. Dog whistles, for instance, are usually in the range of 23 to 54 kHz. Dogs can hear them but people can't. Most animals, including squirrels, can hear ultrasonic sounds. Studies at the University of Toledo found that squirrels can ​49 kHz. Ultrasonic repellents work by emitting variable pitches of ultrasonic sound in a beat and tempo designed to irritate, frighten, and repel squirrels (and other rodents) from a given area. They usually consist of one or more devices set out in a pattern with overlapping fields of sound. Results for ultrasonic repellents are mixed at best. A great deal of anecdotal evidence suggests they do work. While anecdotal evidence is usually taken with a grain of salt (when enough of it builds up), it becomes difficult to ignore the facts with a clear conscience. Ignoring it past that point seems to be a matter of “follow the money, honey” where someone has a financial incentive for denying their results. Equally compelling, however, are collegiate articles which claim ultrasonic repellents don't work at all. The interesting thing about these articles is that while they appear to be scholarly works, they don't quote any actual studies or methodologies. In all our research, we couldn't find any actual studies on the subject. In other words, they claim ultrasonic sounds don't work, but without offering any evidence to support their position – all the while berating the other side for a lack of rigorous evidence! If the evidence is a mixed bag for ultrasonic repellents, what about chemical ones? Unfortunately, we find the same thing here as well. Homemade repellents, such as mothballs, cayenne pepper, or ammonia are touted by many, claiming they work because squirrels don't like the smell. In my 14½ years as a pest control technician I've encountered a number of people who have tried these methods, then told me how disappointed they were when it didn't make any difference. One woman actually found a Copperhead snake happily sunning itself in the middle of a bunch of mothballs on her back porch. Read more: Click here to learn more about copperhead snakes. So much for home remedies! Commercial repellents have a somewhat better track record, however, persistence is essential. Chemical barriers must be constantly maintained and chemicals must be replaced after heavy rains or winds. If they aren't replaced right way, don't blame the repellents for failing to keep the squirrels away. They can only work if you're dead serious in getting the job done. But there are other natural odors that may be competing with them, acting like a Push Me Pull You from Doctor Dolittle. Because the evidence for both ultrasonic and chemical repellents are so mixed, you'll have to do some research. Correction, you'll have to do a lot of research. You'll have to read a lot of material, searching hither and thither for information. Then you'll have to collate it all, weigh it in the balance, and make a decision about which one to get. Read Also: What're the best ultrasonic pest repellers? Or . . . you could let us do all that work and simply read reviews like this to give you a quick summary of what's available and which are the best for the price. ​This short video below will give you more helpful ideas in getting rid of squirrels. As a recap of our list, here are the five squirrel repellents we looked at. Our #1 pick went to the MaxMoxie, but you should also check out the others to see if any of them might be better suited for your particular situation. Specifically, the GizmoMate is nice for those you who need an outdoor/indoor combination. And whether you get an electronic repeller or a chemical one, always be careful with them. Electric shocks can cause significant injuries, while chemicals of any sort are dangerous to your eyes. Out of the repellers we looked out, the MaxMoxie had the most authentic reviews. Most of the other repellers you'll notice have a ton of fake reviews and/or reviews that claim the product didn't work. The MaxMoxie is rated to repel mice, roaches, mosquitoes, spiders, and other various pests. Its ultrasonic waves cover up to 1200sq. ft and it can be placed in most house rooms (attic, garage, etc). 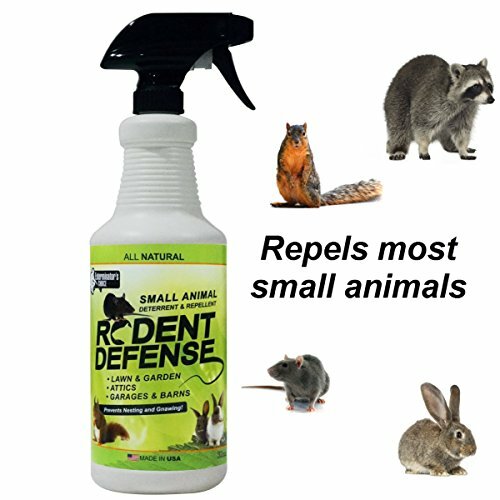 Some users reported effective elimination of mice, cockroaches, and ants. This one goes on back order quite a bit so pick it up quick. ​This indoor and outdoor repeller uses two ultrasonic and one super-low electromagnetic wave, which all alternate to prevent squirrels from adapting to them. 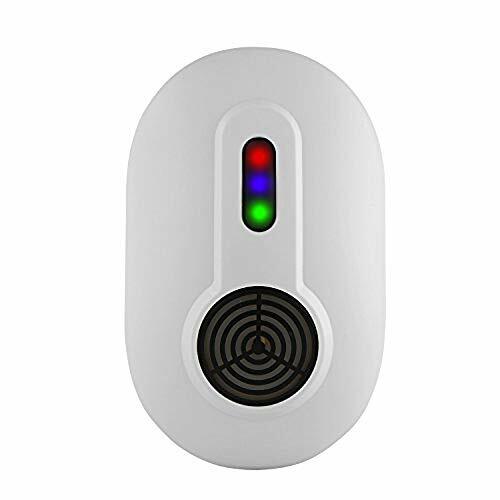 There is a color-coded LED display to monitor the device at all times. The electromagnetic waves are designed to penetrate deep into walls and ceilings. The coverage area is very decent, just over 1100 square feet, which means you need to place them a minimum of 30-feet apart, and perhaps closer if there are heavy wood or concrete walls between the units. They can be used outside but you'll need to purchase an extension cord for each one as they require AC power. There isn't any battery option on these repellers. There is only one unit per box so you may have to purchase several of these depending on the size of the area you want to cover. These devices have a sleek, modern appearance. The GizmoMate has a fairly extensive track record of success which is why we're putting it in second place. ​This is a ready-to-use chemical spray made from all natural ingredients. It contains .025% garlic oil, .0495% peppermint oil, .0225% rosemary oil, .0255% white pepper, and inert ingredients of water and vinegar at 98.877%. This combination is used by professional exterminators with varying degrees of success. The combination of smell and taste works together to repel and discourage squirrels and other critters. ​This product works best in dry climates but it can be used in wet, humid ones if you're willing to re-spray after each rain as well as twice a week to maintain a good barrier around your house, trashcans, etc. There is a one-gallon version available for those kinds of very wet environments. ​The barrier, which needs to be re-applied twice a week, needs to be three feet wide, all the way around every area that needs protecting. Do not spray it directly on food or feed crop areas. It doesn't have any harsh chemical smells, but you wouldn't want to eat it. An interesting trick is to soak several rags with this product then seal them inside a zip-lock baggie. Punch a few holes in the plastic and put the bags around the base of some trees. This creates a high concentration of repellent that is also fairly safe from the weather. The squirrels really don't like it. 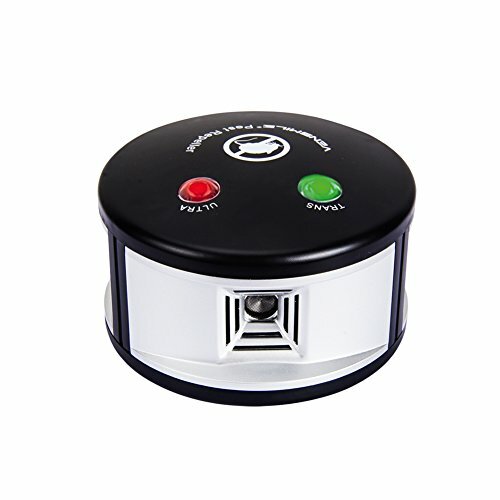 This indoor ultrasonic repelling device comes with an AC adapter and instructions booklet. It is equipped with two speakers and a transducer. The ultrasonic frequencies are 25 kHz to 60 kHz. ​Their effective range is 5,000 to 6,000 square feet – unobstructed. Walls, furniture, doors, carpets, drapes, and other normal indoor furnishings would shrink that area considerably, down to a single room according to the manufacturer. You'll need to purchase one for each room of your house. Since these are indoor only units, they will not affect outdoor squirrels or nuisances. They will only work on them if they're actively trying to gain entrance to your house. The manufacturer advises it will take 4 to 6 weeks before all rodents have been pushed out of your house. However, this is a relatively new product without an established track record. ​These indoor-only units have a relatively small area of coverage, only 1600 square feet. 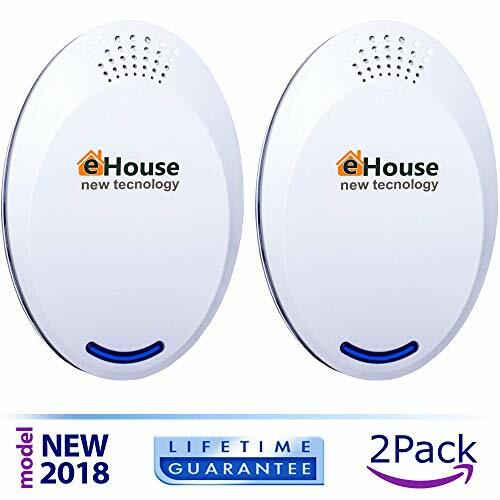 There are two devices in each package which makes it ideal for the typical two-room homes.​ They plug into standard AC electrical outlets and produce 24 to 86 kHz frequencies. .
​The company touts it's customer service, money back guarantee, and claims it will fully refund your money if you're not completely satisfied with the product. It also includes a built-in nightlight on each unit. It also comes with a manual adjustment between five modes of operation – and yes, the nightlight can be turned off if you don't want it on. ​The company claims this product won't hurt dogs and other pets, but since the stated frequencies are well within the normal hearing range of most dogs and other domestic animals, we're a bit confused how they can manage it. This is a relatively new product without much of an existing track record. ​Finally, since this is unit isn't water or weather resistant, it would only be useful against squirrels that try to get in the house. It wouldn't affect squirrels outside. ​There are a lot of competing squirrel repellers on the market today, more than we imagined when we first began looking into it. ​Still, our overall pick goes to the MaxMoxie. It has an extensive track record behind it with a high degree of success at repelling squirrels without killing them. And without having to spray and respray, we might add. It's an outdoor only solution that aims to keep the squirrels from getting into your house in the first place. A close second, however, is the GizmoMate Rodent Repellent, for those times when you need an indoor/outdoor combination to drive squirrels out of your house, then away from it. It also has a decent track record. Final Note: Sometimes, combining two or three different methods will yield a better result than any one of them alone. It's something to consider. Curious about other squirrel related articles? Check out our other detailed guides to help you deal with your pest problems.